This such a great book. It's really original, and managed to surprise me a lot. There's a charming cast of characters, a wonderful focus on how stories define you and who gets to tell those stories, but still incorporates high stakes and tension. It's about courage and autonomy and family, and it does it in my favorite middle-grade way: keeping it short and simple enough to be an easy read, but without dumbing it down. Mayka, our main character, is a twelve-year-old-girl carved out of stone who must leave her mountain home to find a stonemason to re-carve the magical marks on her stone friends, before they fade and become nothing more than statues. But in the city where she hopes to find a stonemason she also finds a terrible threat to stone creatures everywhere. First of all, I like how the fantasy aspects of this world are revealed. I know the blurb hints at some of it, but I'd forgotten the blurb by the time I started so I wasn't even sure if Mayka and her stone friends were an oddity in their own world, or if stone creatures were common. Discovering the nature of the living stone people and animals in this world, at the same time Mayka was discovering what the relationship between flesh-and-blood creatures and stone creatures and stonemasons is outside her mountain, was a really fun experience. One of the first stone creatures we meet after leaving the mountain is a small dragon named Si-Si who wants to be re-carved so she can fly, and I love her so much! (There's a definite cute factor to the book, although it can be perfectly serious) Mayka is surrounded by a cast of characters who have their own goals and personalities, and that makes the journey so much more fun. Also, I know I said this was an easy read, but I was legitimately stressed out at times. The book does not shy away from raising the stakes, and it's based on a really interesting backstory that you learn along the way with Mayka. I love that the backstory/history is another example of how stories change depending on who's given the power over them. 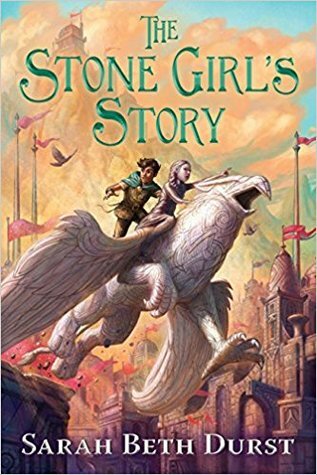 The interpretation of stories is kind of a huge thing in this book, because stone creatures are brought to life by magical marks that tell a story — who they are, their personality, what they want to do. And if you're thinking that that gives the person who carves the stone creature a lot of power over them, that could potentially be taken advantage of... then you're on the right track with this book. There are only two things that I feel the book didn't do as well as the rest of it. First of all, as the blurb tells you, Mayka needs to realize "the savior she’s been searching for is herself" — which is true, and a great message, but it could have used more focus. I think Mayka's realization could have used more set up throughout the story to be a little more powerful when it happens. But there is also so much else going on in the story that it's forgivable that this got less focus. I also felt like the very end, just the last page or two, could have been clipped a little shorter; we didn't need to know that much about twenty years in the future. Which the author clearly knows, because that part is very quick, but I think she could have cut it off a little sooner. To end on a good note: the writing is beautiful, and I have so many quotes highlighted in my ebook. This is exactly the kind of whimsical middle-grade I love to read. Sign into Goodreads to see if any of your friends have read The Stone Girl's Story. "I'm confused about how much Mayka, being made of stone, has touch sensory experience. Sometimes it seems she can feel and sometimes it can't"
"God this guy is untrustworthy though"
"That's dark and stressing me out 😧"
"There's a lot to wrap up in the last 40 pages, I hope the book can do it"